There are settings where an unmanned survey represents more than a safe, cost-effective alternative; it may be the only option. Capitol Lake in Olympia, WA, USA, is such a location. In this article, we report on a recent survey that highlights the advantages offered by an unmanned platform operating in a highly public, environmentally sensitive setting. From their Sediment Management and Marine Sciences office in Seattle, WA, NewFields has been investing in USV research and development to expand services and client relationships for their local consulting and engineering offices throughout the USA. In 2014, the Seattle office acquired the Teledyne Oceanscience Z-Boat 1800 equipped with a dual frequency, single-beam echo sounder. When the challenges presented by the Capitol Lake setting required specialised sonar, they turned to the expertise of a locally-based and well-recognised manufacturer of aquatic habitat and fisheries echo sounders, BioSonics, Inc. 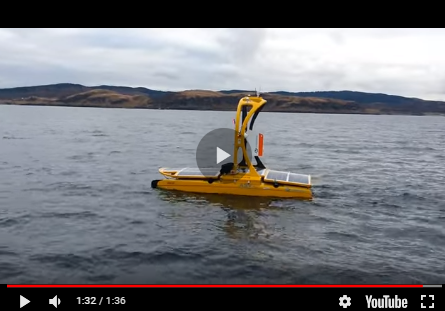 In a collaborative effort, the NewFields USV was reconfigured with a sonar payload optimised to detect and differentiate submerged vegetation from the true bottom. Capitol Lake is a man-made body of water and prominent feature of downtown Olympia, Washington. Located on the State Capitol campus, it is fitting that the lake is also the focal point of a divisive environmental policy issue that has dragged on for decades. The lake was created in 1951 when the State administration implemented a campus improvement plan which included the damming of the Deschutes River and tidal estuary to form a reflecting pool for the Capitol Building. Poor water quality has plagued the lake since its creation, and management of the 35,000 cubic yards of sediment delivered by the Deschutes River every year has become increasingly expensive, leading to a vigorous debate of whether or not to remove the dam and restore the estuary. Most of the sediment delivered by the Deschutes is captured along the middle stretch of the lake, which has previously been dredged to trap sediment. The sediment has recently been determined unsuitable for release to the natural environment, adding complexity and cost to dredging. With the sediment trap at capacity, more material is expected to reach the ~100 acre North Basin (Figure 2). Regular bathymetric survey data is needed to understand the volume and spatial extent of sediment deposition in the basin; however, the recent infestation of a high-risk invasive species has introduced a new challenge for researchers. In 2009, the New Zealand Mud Snail (NZMS) was found throughout the Capitol Lake basin. The tiny snail is extremely difficult to eradicate and is easily transported between lakes and streams on the boots and boats of fishermen and scientists alike. To contain the infestation, access to Capitol Lake and the shore has been prohibited. This has consequently limited research intended to address the multitude of problems plaguing the lake, including sediment management and water quality. The Z-Boat operated by NewFields is a 1.8m vessel with dual 24V electric thrusters, dual antenna GNSS, and a 40kg payload capacity which can accommodate several different sonar systems. Originally designed for high speed operation in flooding rivers, the 10kt survey boat offers a stable platform for surveying inshore environments such as ponds, lakes and reservoirs. With a hand-held remote control unit and laptop, the operator is able to navigate and view data acquisition in real-time through a high-bandwith 5GHz wireless Ethernet connection capable of transmitting over 1km. Navigation along pre-determined survey lines can also be automated by adding an optional control module. The engineers at BioSonics reconfigured the NewFields Z-Boat to match the specs of the turn-key Z-Boat 1800MX using HYPACK for survey line navigation. The MX echo sounder with 204.8kHz, 8.5° single-beam transducer is optimised for plant detection and substrate classification in addition to bathymetric data collection with an accuracy of +/- 2cm. Visual Acquisition software installed on the shore laptop is used to control the MX and data logging. An important objective of the survey was to compare with an existing US Geological Survey (USGS) dataset. In 2004, the same area had been surveyed using a personal watercraft outfitted with a 200kHz single-beam echo sounder. At that time, patches of submerged aquatic vegetation (SAV) could be seen beneath the surface of the lake, and made it impossible to determine the true bottom for several areas. The original USGS survey lines were used for mission planning. Each planned line was split so that transects would cover about ½ the distance across the lake. Using this method allowed for an efficient, controlled transition between survey lines in open-water. Geodetic control was established by relating the lake water level to a physical monument measured on the seawall. Elevation of the physical monument was surveyed using the iGage X90 OPUS antenna, utilising the precise National Geodetic Survey OPUS post-processing service. A survey work plan was emailed to the State, which included deployment and recovery of the Z-Boat 1800MX from an elevated seawall. Avoiding the muddy shoreline significantly cut the decontamination steps required to conduct the work, and played a large part in having the low-impact work plan approved by multiple agencies in less than 2 weeks. Under calm, clear skies on 17 April 2015 the 6hr survey covered more than 20km with minimal cross-track error. Thrusters and rudder trim were adjusted to maintain a consistent ~5kph survey speed and true course throughout the day. Ground control GPS data were recorded for 5hrs during the survey to generate an OPUS solution with vertical position accuracy of +/-1cm. The MX data files were processed with BioSonics Visual Habitat software, which provides information about the location and quantity of submerged vegetation, substrate types and bathymetry. Visual Habitat utilises a proprietary algorithm to generate a bottom track based on user defined signal level threshold and echo characteristics. A separate algorithm – matched to the vegetation type - is used to generate the plant canopy line. Substrate classification is based on a principal components analysis resulting in delineation of distinct substrate area based on the relative hardness or smoothness of lake bed. The Visual Habitat results were exported in a format suitable for viewing in Google Earth to generate preliminary maps for quick assessment. Data were then exported in table format and loaded into QGIS, an open-source geographic information system (GIS). Corrections were then applied to each record based on timestamp to translate depth to NAVD88 while accounting for variation in the lake level. A triangulated irregular network (TIN model) was generated from the bathymetry data and converted to a raster grid. The result was a 2 metre resolution digital elevation model (DEM) which could be used to create a shaded bathymetric map and facilitate volumetric computations (Figure 3). Results of the Capitol Lake survey were directly compared to the 2004 survey. Areas where submerged vegetation obscured the bottom were obvious when comparing the transect data and the DEMs from the two surveys (Figures 4 and 5). The echo sounder used in the 2004 study was limited to a serial data feed of digitised soundings only. Those soundings were post-processed (filtered) to remove plant artifacts, leaving high uncertainty in areas of dense vegetation. The raw acoustic data captured by the MX echo sounder was essential for determining an accurate depth in this setting, and distinguishing between plant canopy and the true bottom. It follows that comparing the plant data from the 2015 survey shows a similar pattern as the irregular contours from the 2004 survey. Results of the bottom-type analysis are presented along with bathymetry in Figure 3, and reveal a pattern that correlates with the general morphology of the former river channel and current lake basin. Sediment cores collected from the area in 2005 suggest that the patterns are likely driven by distinct spatial patterns in grain size. Settings such as Capitol Lake demonstrate some of the advantages of utilising USVs for inland or nearshore applications. With the Z-Boat 1800MX as an example, a stable and reliable platform is key to transitioning from the test-tank to the real world. Commercial users of unmanned technology, such as NewFields, can easily add unmanned surveys as a versatile complement to existing client services. And with the growing market, more manufacturers are designing instruments with compact electronics and housings that are compatible with the power and size limitations of USVs, ROVs and AUVs. Building on the success of the Z-Boat 1800MX platform, BioSonics is currently working to integrate their split beam DT-X echo sounder into the Z-Boat for fish stock assessments in remote areas, and offer the MX system in a more compact geometry for ROV/AUV applications. We would like to thank the USGS for assistance with planning and data requests, and the Washington Department of Enterprise Services for help in expediting survey approval.